Straight from beautiful Hawaii, your pooch can now wear stunning jeweled creations that will distinguish your pet from all the rest. Le Prissy Pets, Inc. was started approximately 4 years ago by a few dedicated doggie and animal lovers who just wanted to create something unique and special for their babies. Since then, our company has grown and our dedication and love for animals has taken on an even greater meaning. We participate and donate to countless no-kill animal shelters, rescue many tiny Chihuahua babies used only for breeding, spent many countless nights loving and nurturing these babies back to health and then finding them loving homes where they will never be bred again. We strive to provide the best in customer service and most importantly we love what we do and we are proud of our work. Aloha and Mahalo to you from Hawaii. We have several collections that combine beauty and functionality to insure that you not only receive the most beautiful products, but also products of the highest quality. Here is a small sample of our vast collections, to view all of our collections please visit our website. Petstacular Collection- The first in our collection is the Brandiana. Our Brandiana Necklace is a step up in elegance. Using Swarovski Crystals & Pearls, this is the perfect necklace for those extra special occasions. Our Chanel Necklace offers a classic one of a kind beauty using our Swarovski Crystals, beautiful accents, which will surely set your pooch apart from the rest. The Chippentail is exclusively for our male babies, which has a handsome crystal bow tie that is very distinguished! Frou Frou is a beautiful necklace for our extra fancy pooches that is accented with a sterling silver heart charm. Our Princess Belle is a gorgeous necklace, which features pearls and is really two necklaces in one! The finale of this collection is the Prissiana which features distinctive Swarovski Crystals and a unique beauty all its own! Swarovski Crystals And Pearl Collection- The Swarvoski Crystals & Pearls collection is nothing short of charming and beautiful. Each creation is specially created to bring out your pet's inner fashionista. The first in this collection is Sweet Pea, which contains two rows of elegance using Swarovski pearls and either crystal rounds or crystal bicones. The next part of our collection is Fifi, which has a gorgeous intricate weave using Swarovski pearls and/or bicone crystals. This is a necklace that only a Princess or Prince would wear. Honey Child is simply elegance personified and is perfect for the dignified pet. The MiMi Bow is delicate and dainty using only the finest Swarovski pearls and crystals. Finally we offer The Tinkerbell, which is available in 5 colors. Canine Couture Collection- Not all our fur babies are made to fit into teacups and so we introduce a new collection. Canine Couture is an exclusive line of products made for the large breeds with discriminating taste. Also with this new line is an added option for ultimate comfort. Choose between a nylon or leather backing, complete with a "D-Ring" to transform the stunning necklaces into durable, dependable, breath-taking collars. We welcome you to take a look at this gorgeous new collection. What Do Our Customer's Say About Le Prissy Pets? This is the most exquisite jewelry for pets that I have ever seen. Thank you so much for Pumpkin's necklace. I am at a loss for words. Thank you so much, just gorgeous! Laverne and the girls are some of the nicest people I have ever met. Their work is beautiful and they take time to give you personalized service. Order Your Le Prissy Pet Design Today! Allow your pet to show off their elegance and distinction with a beautiful creation from Le Prissy Pets! 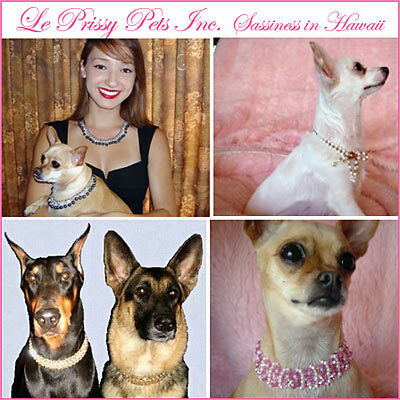 At Le Prissy Pets we are dedicated to creating only the finest jewelry for your canine friend in both beauty and quality. Please view our website to view our vast collection of jewelry, we know we have the perfect product for your pooch!